Four-point-two million young people experience homelessness in the course of a year. That number comes from a study that's out today from a research center at the University of Chicago. Advocates say it's the first study that attempts to get a true picture of a growing and mostly hidden epidemic. NPR's Leila Fadel reports. LEILA FADEL, BYLINE: One in 30 teens experiences some type of homelessness in 12 months, and it rises sharply for young adults, 1 in 10 for people between 18 and 25, people like 21-year-old Marquan Ellis in Las Vegas. MARQUAN ELLIS: Once I finished high school, everything just kind of crashed. It came all to a head. 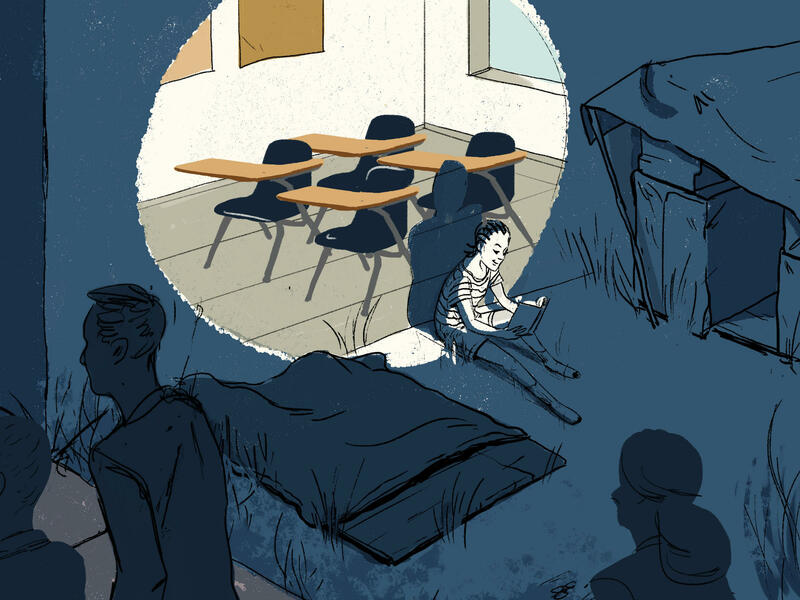 FADEL: Nevada has the highest rate of unsheltered youth in the country and the fourth-largest youth homelessness population, and Ellis was briefly one of them. At 18, his mother was in the throes of a drug and gambling addiction. They were evicted and couch surfing, and it felt unsafe. So he started sleeping where he could on his own. His last spot was his godmother's, but she was moving. ELLIS: She woke me up, like, two days before she left and was like, look; I really don't want to see you out here on the streets, but I'm about to leave, so you've got to find you somewhere to go. FADEL: At 19, he didn't know where to turn. He borrowed his godmother's phone. ELLIS: And I just typed in anything random. I typed in, Las Vegas youth place. I just typed in something on Google. (Laughter) Like, it was the most randomest (ph) things. FADEL: And the Nevada Partnership for Homeless Youth popped up. He was lucky. He got into their independent living program. He hid his troubles. That's what teens do, says Arash Ghafoori, the executive director of the Nevada Partnership for Homeless Youth. ARASH GHAFOORI: They're trying their hardest not to be seen by anyone because they don't want to be abused. They don't want to be ostracized. They don't want to be stigmatized. This is our sort of clothing pantry, our laundry facility. FADEL: He shows me around the drop-in center designed to feel like home. Teens play music, do laundry, eat, get online and lounge. Nevada has such a high unsheltered youth population, Ghafoori says, in part because there aren't enough shelters. But it's also easy to hide in Las Vegas. GHAFOORI: Because we have a 24/7 city, youth can more easily blend in and stay invisible here as opposed to other communities. FADEL: And Ghafoori says because the issues are so hidden and so different than adult homelessness - young people are typically thrust into homelessness because of family breakdown, abuse, or abandonment - it isn't properly addressed. Advocates for homeless young people say they were anxious for a report like this because there is so little reliable data that shows the scope and nuance of the problem. And now they hope the data will help them persuade donors and local and national policymakers to take action. GHAFOORI: We really need to dial back and be focused more on prevention. There are certain subsets of homeless youth that really require culturally sensitive and specifically tailored services. FADEL: Like members of the LGBTQ community. They're 120 percent more likely to be homeless. African-American and Hispanic youth experience homelessness more often, and young people without a high school degree and single parents are the most vulnerable. And this isn't just an urban thing. Young people in rural parts of the country experience homelessness at a similar rate. Matthew Morton is the lead researcher on the report from the policy center Chapin Hall. MATTHEW MORTON: Youth and young adulthood represent a critical developmental window in our lives, and every day of homelessness is a missed opportunity to support their healthy development and also their capacity to contribute to stronger communities and local economies. FADEL: He says the need for prevention is urgent, and they'll take their findings to legislators. Leila Fadel, NPR News, Las Vegas. (SOUNDBITE OF FLYING LOTUS' "ALL IN") Transcript provided by NPR, Copyright NPR.